The Midrasha, established over 10 years ago, is an alternative seminary program for religious girls who would like to spend their time in Yerushalayim in an exciting and inspiring environment. The girls can benefit from a combination of quality Shiurim and a variety of courses and fun activities. The Midrasha is recommended by Rabonim, Mechanchim and professionals worldwide. The Midrasha is situated in the Ramot neighborhood of Yerushalayim in a beautiful and spacious villa. The villa is well kept, complete with all facilities and a garden. The Midrasha has an open kitchen policy. The girls have a choice to benefit from the delicious meals that the cook prepares or prepare their own food from our well stocked kitchen. Only certain Hechsheirim are allowed. We have a very dedicated staff at the Midrasha. Mrs. Esther Halpern lives in a self-contained apartment adjacent to the Midrasha with her young family. She is in charge of the upkeep and welfare of the Midrasha and its occupants and can be reached at 052-768-8138. The madrichot are available for the girls to assist in any way possible. We have a social worker on staff. She is available for individual counseling by appointment. 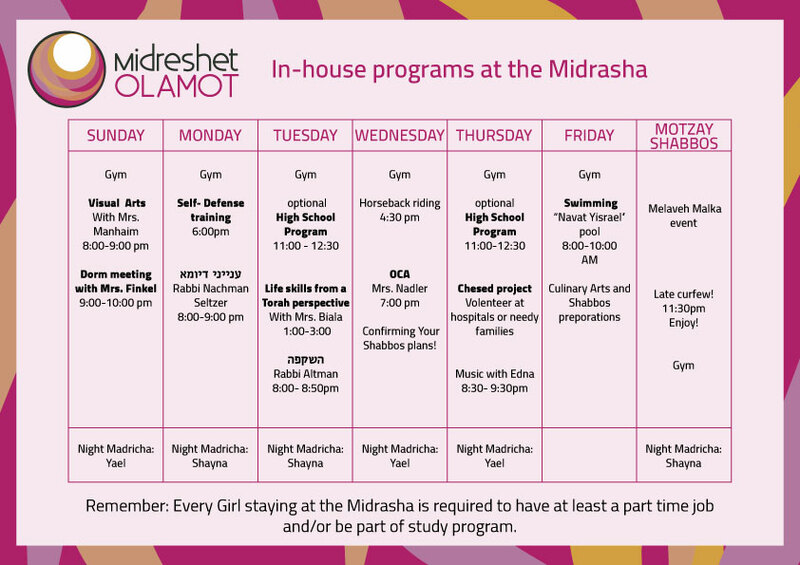 At the Midrasha, every girl has an individualized program during the day. During the morning hours there is an option of studying towards a high school diploma. Some girls work or volunteer. In the afternoon the girls can choose from a variety of courses such as, art, music, gym, cosmetology, gardening and ulpan. They can also sign up for courses offered by CompUskills, they can be reached at: 02-654-1268. Some of our girls are currently taking college courses at Jerusalem’s Touro College Center and Kampus Strauss. In the evening there are well known speakers who present stimulating workshops and shiurim. Our Rabbonim are well known speakers who have positions on other seminaries as well as Kiruv programs such as Eish Hatorah and Arachim. Every other Shabbos, the dorm is closed and the girls go out to spend a Shabbos with family or friends. Occasionally, the staff will join the girls for a stunning Shabbos away, each time in another place around the country. The Midrasha is closed for all of the Chagim. We are open on Purim and Chanuka. On Chol Hamoed, the dorm will be open upon demand.  Girls must dress according to Halachah at ALL times. This includes the ground floor in the dormitory.  Curfew is at 10:30pm every night and at 11:30pm on Motzoey Shabbos.  There is a weekly Toranut (job rotation), were every girl takes her share in keeping the Midrasha neat and tidy.  A basic filter is required on all Internet-capable devices. Non Jewish music may be heard on earphones only. All electronic devices are for personal use only.  Alcohol, cigarettes and other damaging substances are forbidden. Men are allowed in the dorm by appointment only.  Every girl commits to having a full time program which includes volunteering in the community once a week. Occupational guidance is available by our staff.  One month’s paid notice must be given in writing if a student wishes to leave the Midrasha. If a student is unsure about the rules or the norms at the dorm, she is encouraged to consult with a staff member. The first month of the Midrasha is a trial period, where the staff and student get to know each other and asses’ compatibility. The recommended stay at the Midrasha is 6-12 months, with the option of an extension if deemed beneficial.